I started the ArcSeer project in the autumn of 2009. This was the final year of my undergraduate degree at Trinity College Dublin and as such I was required to focus my attentions on a dissertation. I chose to write about the topic of representation in archaeology and while I began the work in the traditional manner by compiling and writing a review of existing and past practice in the field, I wanted to also move the discussion on to a consideration of how archaeological data and knowledge might be represented in new ways. I was particularly interested in how digital media and techniques might be used to represent the more subtle narratives that were being encouraged by the reflexive archaeologies espoused by Ian Hodder, Christopher Tilley, Michael Shanks and the others that had first reacted against the positivist dogma of the processualist archaeologies during the 1980s. Users are encouraged to engage with and add to the data and its interpretation. This type of feature can broadly be associated with the democracy of knowledge production movement within archaeology. An attempt is made to provide a more multisensory experience to the consumer of the representations. In the past the visual sense was almost exclusively the sole recipient of archaeological representations. My undergraduate project was completed as a traditional print thesis alongside a digital deliverable in the form of the www.arcseer.com website. 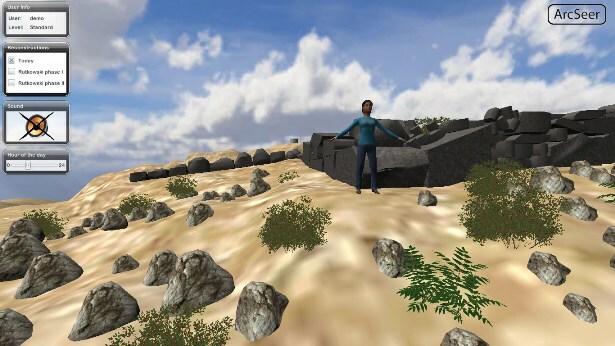 I took the Minoan peak sanctuary site of Petsofa in East Crete as my initial case study and this as well as newer projects such as the sites of Priniatikos Pyrgos, also in Crete and Masada in Israel can be interacted with at the project website.